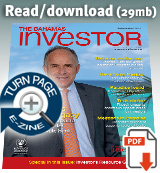 The Bahamas Investor's Home Page consists of a News & Press section, the feature's from The Bahamas Investor Magazine currently in print–including links to a page turning browser. Every issue is included in our archives. Browse all feature stories. Please browse advertisers in our Ad Index.